The Seattle Mariners head to O.co Coliseum on Saturday to take on the Oakland Athletics. The probable pitchers are Felix Hernandez for the Mariners and Kendall Graveman for the Athletics. The opening line for this game has Seattle at -121 and Oakland at +111. The over/under is 8. The Mariners have a 73-62-5 over/under mark and a 70-70-0 run line record, meaning they cover 50% of the time. The Athletics are 75-64-0 against the run line and have a 61-73-5 over/under record. They cover the spread 54% of the time. The Mariners head into this game with a 72-68 record, and they are 32-37 on the road. Starting pitcher Felix Hernandez has a 10-5 record with an ERA of 3.75 and a WHIP of 1.28. He has 107 strikeouts during his 127.1 innings pitched and he has given up 107 hits so far this year. He has surrendered 7.6 hits per 9 innings and he has a FIP of 4.64. The bullpen this season has an earned run average of 3.87 and they have allowed 411 base hits on the year. Teams are hitting .237 against the pen while they've been struck out 478 times and walked 160 times this year. As a unit, Seattle has given up 8.91 base hits per nine innings while striking out 8.15 hitters per nine. They are 15th in the Majors in team earned run average at 4.18. The Mariners pitchers have collectively given up 1,234 base hits and 580 earned runs. They have allowed 192 home runs this season and they allow 1.4 homers per nine innings as a staff. Seattle as a pitching staff has walked 401 batters and struck out 1,129. They walk 2.9 men per 9 innings while striking out 8.2 per 9. They have a team WHIP of 1.31 and their FIP as a unit is 4.43. As a team, Seattle is hitting .260, good for 11th in the league while putting together a .259 average on the road. The Mariners have a .431 team slugging percentage and an OBP of .327 which is good for 11th in the league. They rank 12th in baseball with 8.9 hits per contest. Kyle Seager comes into this game hitting .292 and his on-base percentage is at .373. He has 148 hits this season along with 80 runs scored and 88 runs batted in. He's struck out 87 times and has walked 60 times. Robinson Cano is hitting .304 and he has an on-base percentage of .355. He has totaled 171 hits so far while scoring 91 runs and he's driven in 86. He has walked 39 times and has struck out 85 times. The Mariners have 1,235 hits, including 211 doubles and 191 home runs. They've stolen 44 bases while they've been thrown out stealing 27 times. Seattle has walked 435 times this season and they've struck out 1,094 times as a unit. They've left 933 men on base and have a team OPS of .757. They score 4.72 runs per contest and have scored a total of 656 runs so far this year. Oakland comes into this game with a 33-39 home mark and a 60-79 overall record. With an ERA of 3.81, Kendall Graveman has a 10-9 record and a 1.28 WHIP. He has 95 strikeouts over the 163 innings he's pitched during which he has given up 166 hits. He has allowed 9.2 hits per nine innings and his FIP stands at 4.54. So far this season the bullpen has an earned run average of 3.97 and they have given up 447 base hits on the year. Teams are hitting .243 against the Athletics bullpen while being struck out 456 times and walking 166 times this season. As a team, Oakland has allowed 9.22 hits per nine innings while striking out 7.5 batters per nine. They are 26th in the league in team earned run average at 4.55. The Athletics pitchers as a team have surrendered 1,260 base knocks and 622 earned runs so far this season. They have given up 161 home runs this year and they give up 1.2 home runs per nine innings as a staff. Oakland as a staff has walked 412 hitters and struck out 1,025. They give up a walk 3 times per 9 innings while they strike out 7.5 per 9. Their team WHIP is 1.36 while their FIP as a staff is 4.30. As a team, they are batting .245, good for 26th in the league while putting together a .239 average at home. The Athletics hold a .393 team slugging percentage and an on-base percentage of .302 which is good for 28th in baseball. They rank 25th in baseball with 8.32 hits per contest. Danny Valencia comes into this matchup batting .294 and he has an OBP of .349. He has 118 hits this year along with 60 runs scored and 47 RBI. He's struck out 96 times and has walked on 32 occasions. Khris Davis is hitting .250 and he has an OBP of .300. He has collected 121 hits so far while he's scored 72 runs and drove in 86. He has earned a walk 29 times and has punched out 145 times. 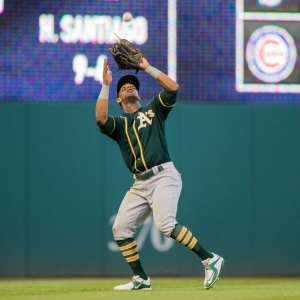 The Athletics as a unit have 1,156 base hits, including 224 doubles and 144 homers. They have 45 stolen bases while they've been thrown out 20 times. Oakland as a team has walked 359 times this year and they have struck out 974 times. They've had 891 men left on base and have an OPS of .694. They score 3.91 runs per game and have totaled 543 runs so far this season.